The Professional Regulation Commission (PRC) and the Board for Civil Engineering release results of November 23-24 Civil Engineer board exam in 3 working days after the last day of exam. On this page you'll find the complete list of passers, top 10 (topnotchers), top performing schools and performance of schools once results released online. The Professional Regulation Commission (PRC) announced on Wednesday, November 27 that 3,168 out of 6,584 passed the Civil Engineer Licensure Examination. 1. University of the Philippines - Diliman (UP-D) : 92.39 % passing percentage. 2. 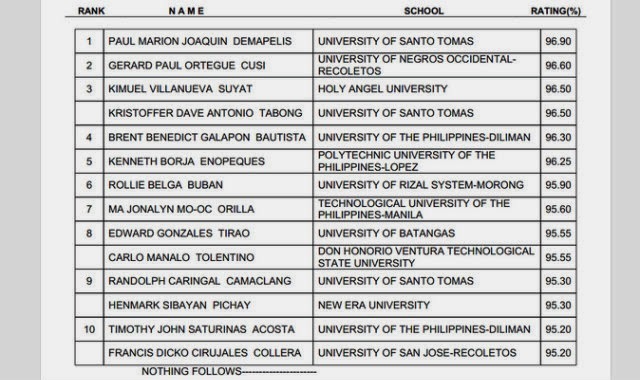 University of Santo Tomas (UST): 91.79 % passing percentae. 3. Technological University of the Philippines-Manila (TUP-M): 83.87 % passing percentage. Civil board examination was administered by the Board of Civil Engineering headed by Engr. Apollo S. Enriquez, Chairman and Engr. Praxedes R. Bernardo, Member. Exam was simultaneously conducted in several testing centers nationwide: Manila, Baguio, Cagayan de Oro, Cebu, Davao, Iloilo and Legazpi. The exam covers the following subjects: mathematics, surveying and transportation engineering and hydraulics and geotechnical engineering (Day 1) and structural engineering and construction (Day 2). In November 2013, results were available online in just 3 working days. 2,380 out of 5,747 passed the Civil Engineer Licensure Examination. 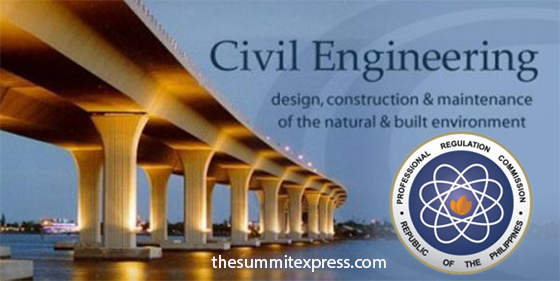 Subscribe now to our E-Mail List, Like Us on Facebook and Follow Us on Twitter to receive more updates related to Civil Engineer licensure exams in the country.